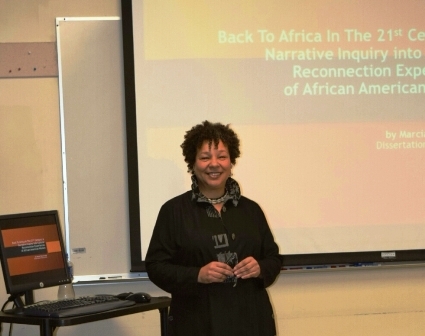 Dr. Marcia Tate Arunga at her Dissertation Defense at Antioch University, Seattle. 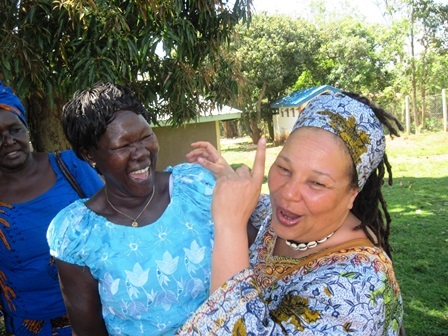 Marcia Tate Arunga, Ph.D. [right] enjoying re-connection in Kenya with Leonider Ayeke [Center] and Kisumu Cllr. Prisca Auma Michachi [left]. Marcia Tate Arunga is the cofounder of African American Kenyan Women's Interconnect (AAKEWO), responsible for planning the travel itinerary from USA, to Kenya, East Africa as an exploration of returning to the ancestral homeland. Marcia teaches courses in Sociology of the Family and Leadership at Seattle Central College. She is the author of The Stolen Ones and How They Were Missed. Arunga, Marcia Tate, "Back to Africa in the 21st Century: The Cultural Reconnection Experiences of African American Women" (2017). Dissertations & Theses. 341.